Twinkle Pink: EVERYTHING IS COMING UP HEARTS! Here are some of my hand made bags / totes from antique English Quilts and 1930's 40's Eiderdown fabrics which I have enhanced with creative embroidery. Having been sorting out my workroom for the last week, I am now coming up for air and realise the problem is much worse than I thought!! I have unfinished heart samples all over the place and vintage cutter quilts waiting for me, half given up hope on me ever reinventing them again into something wonderful. Over the past few years I have sold quite a few home accents including bags and cushions. 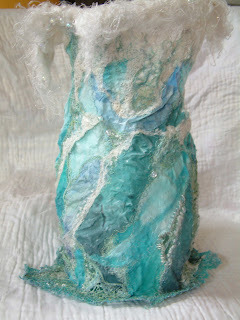 But having decided to pursue a City and; Guilds in Textile Art and Design I then ended up with pile of projects on hold. Below are a few of my commissions including this huge cushion cover and bucket bag. They are all made with vintage and antique fabrics and quilts. I like to included applique hearts on the totes and cushions because hearts are a sign of love and a lot of love went into the product. I always promised myself I would make myself some huge cushions and a quilt so having unearthed all these smaller projects that is what I will do. I'VE GOT PILES MORE THINGS TO SORT! Here is a taster of some Textile Art Work. Both are a water theme. The first is microscopic snowflakes using image transfer on linen and a lot of stitch incorporated within a light box. This vase is made with silk and silk waste using a technique called acetate & acetone. 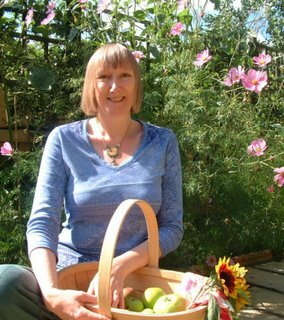 Ginny, your work is simply exquisite! Wow! So beautiful - you must start to make more things to sell - your talent must not go to waste! 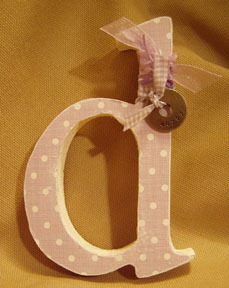 - little shops like mine need talented people like you to supply beautiful handmade items. And i agree with Clare - you can never have too many hearts! Such beautiful work Ginny. You have some gorgeous fabrics and quilts. Yes, start recycling those cutters again! Wow, the things you make are absolutely lovely. 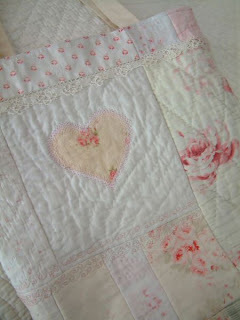 I adore the samples with the hearts - and all those vintage fabrics with roses that you use! I like to make patchworkquilts myself, but find it so hard to find lovely fabrics. I do collect old lace, though, and combine them with rosy fabrics in some of my quilts. Thank you for the inspirasion! Wow, you have some beautiful work. You should make more things to sell. I use hearts on a lot of my work too. I love them. Good luck with the rest of the the sorting. Gorgeous quilts and cushions! You should definitely sell them again! Hi Twinkle Pinkle, or I better call you Ginny too if I'm allowed to. Thanks a lot for stopping by my blog and leaving such a nice comment :D! Your blog is lovely and I like your rose hearts very much! All your work is gorgeous! I'll be back! so so pretty! I adore hearts and roses. I'm attracted to anything heart shaped especially when thrifting. Those bags are just beautiful! This is gorgeous, just found your blog its fantastic! How lovely these things are!